Traditional Chinese Medicine (TCM) consists of 5 branches, acupuncture, herbs, massage, meditation and nutrition. We make recommendations for individuals based on constitutional patterns and conditions. 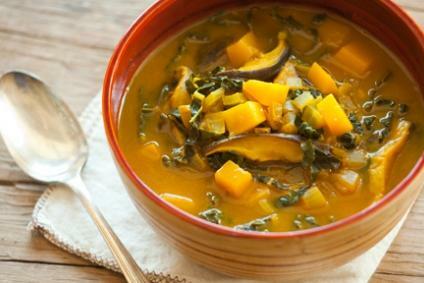 In general, immune tonic foods are recommended for most patients during the autumn. Here’s a great recipe from Whole Foods Markets for an Autumn Immune Boost, you may be able to find astragalus root at your local health food store or co-op. This immune-boosting soup is made with a virtual garden of powerful ingredients that contain beneficial nutrients for your immune system. 1. In a sauce pot over medium-high heat, sauté onion and garlic in oil 3 minutes. 2. Add turmeric and mushrooms. Sauté 2 minutes. 3. Add broth, kale, squash, ginger, cayenne and astragalus. Bring to a boil, reduce heat, cover and simmer 15 minutes. 4. Remove from heat and let cool slightly. 5. Add lemon juice and miso (adding miso when still very hot will diminish its probiotic benefits). 6. Cover and let sit 5 minutes before serving.